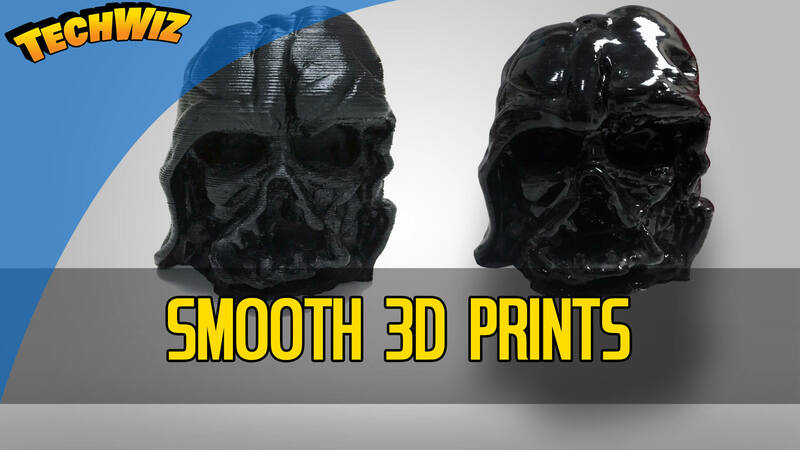 After going through my 3D Prints, I found the Darth Vader Melted Mask model that I printed a while back. It had very prominent print lines throughout, so after a little bit of Googling, I came across on Amazon the Z-Poxy PT39 30 Minute Set in an 8oz set. A few other tools that I purchase while on Amazon were mixing cups, stirring sticks, and horse hair brushes. These tools are pretty much essential when it comes to mixing and applying the Z-Poxy solution to your 3D prints. I used a one to one solution of the resin and the hardener as specified in the instructions. This was squeezed into one of the mixing cups , and then using the stirring sticks, the solution was mixed for a good minute until it went cloudy. Once mixed thoroughly together, you can start applying the mixture to the 3D print using the horse hair brushes. When applying the solution to the 3D prints, make sure you don’t over apply to the surface as this will make the model look lumpy even though the resin does dry clear. Pay special attention to overhangs, as too much application in these areas will cause an excess dripping look. Just like in my video that I created down below, my Darth Vader Melted Mask started looking like a drooling bulldog. The Z-Poxy solution recommends 12 hours for the epoxy to fully cure. Whilst it is quoted as being a 30 minute solution, this is just the time before the hardener starts setting. With all said and done, there is a learning curve to getting this exactly right. And just with anything, practice makes perfect. If you’d like to see the process from start to finish, then check out my YouTube video and make sure that you subscribe to my YouTube channel for all the latest updates. Have you done any post-processing to your 3D models? Or have you tried using epoxy as a smoother for your 3D prints? Leave a comment down below, and let me know what methods you use for your 3D models.